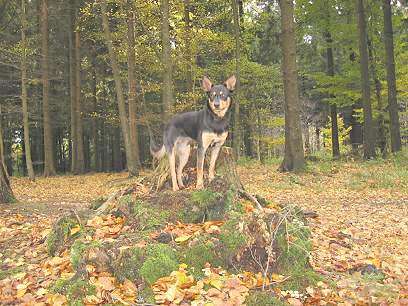 Owned by Kirsten Wosnitza in Germany. She bought two Kelpies together, the other is Noonbarra Scott. He can also be seen on this web site. 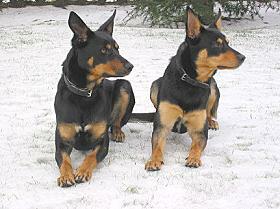 The owner has had experience with Border Collies but these are the first Working Kelpies and the beginning of the new Stud. 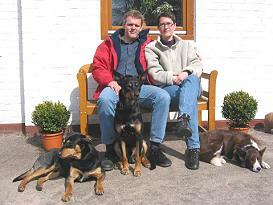 "Thank you for all the support you gave to us and the two wonderful dogs." Just watched TV tonight and the great thing was that Mate and I were on it. Went to a trial yesterday and the little dog won it! And as they had the camera team there the whole day we got taped and broadcasted! 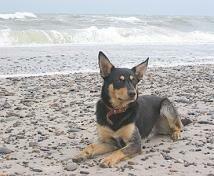 Kirsten has been in constant contact with us since buying her two Noonbarra Kelpies in 2001. She has worked hard and done a lot of training on them and they have blossomed. This page is only a fraction of the feedback and photos we have received from Kirsten. She has even sent us calendars made up of photos of her dogs as a present. 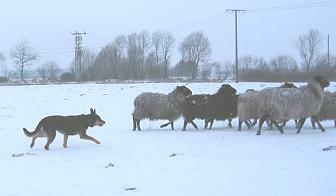 We are very lucky to have a customer like Kirsten who clearly appreciates her Kelpies and has developed them into excellent working dogs on her farm in Germany. 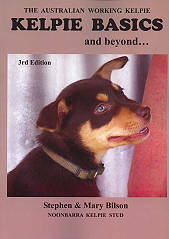 I had the pleasure of doing the basic training on Noonbarra Mate before he left for Germany and he was a very similar dog to his sire, Noonbarra Dusty III. 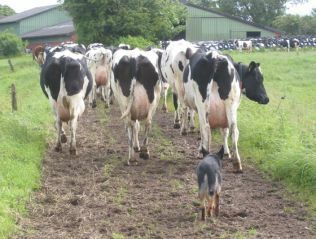 "On the farm the cows are out for 10 days now. Mate started to work them after the break of about 5 months even better than last year. I think it is his age and the sheep training. He got far calmer and knows exactly what to do and where to be. The cows do not question a lot." 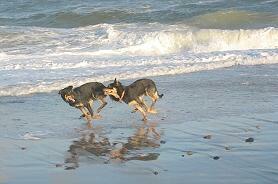 "They travel very well and stay in the back of the car without trouble. .... Mate still loves everybody and shows he is a little pup. 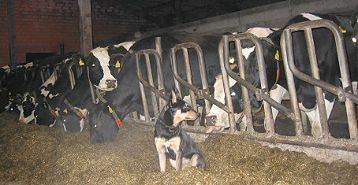 On the other side he wants to tell the big cows that he is boss when they are looking out of their stalls. 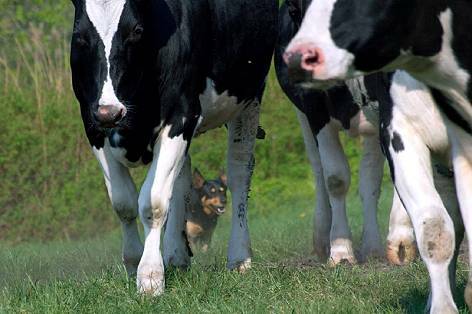 I stop him from biting noses and chasing calves." "We also started with sheep. Have not done very much. First I put my five sheep in a pen and sent the dog around. They both balanced well and stopped at 12 o'clock. 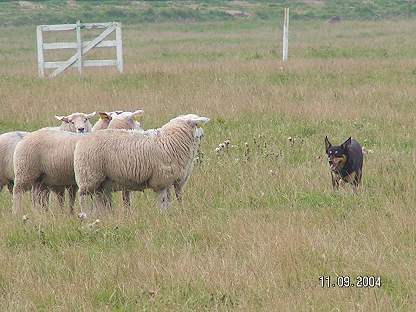 We then trained control so that they would lay down, come to me and leave the sheep without a leash. No problem. Then sheep were released, dogs were both quite fast. I have a long stick to wave so they stopped coming in too sharp. My own five sheep are due to lamb. But they are quiet and move easy. So we train just a bit. ...People are impressed how good they behave and like the look of them. I reckon Scotts body conformation is more like his mums and Mates like his dads." 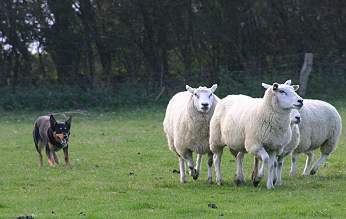 "Just had a little lessons on sheep with a friend border collie trainer again. He was really impressed how keen they are and how well they are working and even 7 months now!" They cover very well and spot every sheep wanting to escape. I am only a bit insecure because of there might be a different way of training them from BC do not want to mess the dogs up or confuse them. Maybe you have some tips for me." "They are really keen and love to work! What I saw in their style of working should be exactly what we want for our cows. But will not start on cows until they are good trained on sheep." "They really got part of our little family and I think I would not like to miss one of them. I try to take them a lot with me, this week we might even have to go on a train. In Summer we will take them with us on holidays to Denmark." "As you can see we took a few days off and went to Denmark. 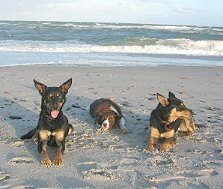 Weather was not too good which was good for me because there were not too many people at the beach so the dogs had a good time. They met a lot of people and dogs, had to go to restaurants and do a lot of new things and there were no problem at all." "Mate is developing very nice style and balancing well (much more than Scott does). I am still not really in control of him when he is excited or concentrated but I think this will come while he is getting older." "I really enjoy working with the two guys." "Just wanted to let you know how we were doing on our clinic in Denmark. This was really exciting for the three of us and I was quite nervous about it. 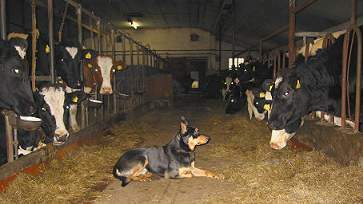 But everyone was really understanding even there were the BC top handlers from Germany and Denmark." 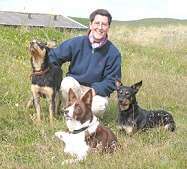 " Mr Mosse from Ireland has been a lot around the world and knew a lot about different breeds of sheep dogs. He took Mate and showed me what to do (and what not to do...) So the result I think it was about the same you explained to me before. All I tried to work on was to control myself ( made some mistakes) and to make the dogs to control themselves without many commands." "After a while they showed the behaviour you were already forecasting. I had to get after Mate a few times and then he started to keep distance by himself and got much slower even on his flanks. He also balanced much better and was not just following the sheep but also watching the handler." In between we took the dogs off the sheep a few times and then restarted again to get more control. I was very satisfied even if it will take me a long time to get it all right I think I got a good idea what to do." "So even from a BC trainer I got to hear that they are still pups but I got some real good working dogs which have everything they need to be good workers and also a very good character and temperament." 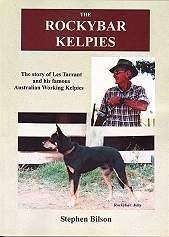 "It was a very good experience because I heard from some Kelpie people over here that they had trouble with working with BC trainers on their Kelpies. 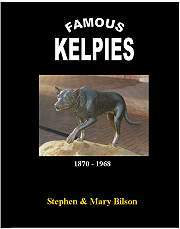 On the other hand there seem to be quite a lot of prejudices against Kelpies because most of the dogs people saw seemed to be Show Kelpies. I hope this will change by the time." We went to a trial/clinic on an island close by. Our ISDS classes are divided from 1-3, one is the very beginner. Mate has to start in 2 now. 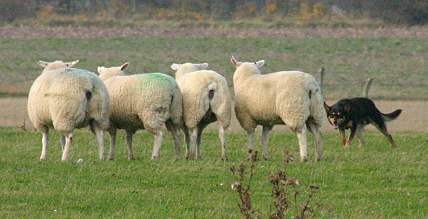 We had very strong Texel sheep, not much used to dogs. 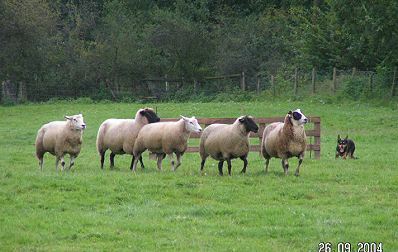 The course was set up on their house paddock, so the sheep new the way out. 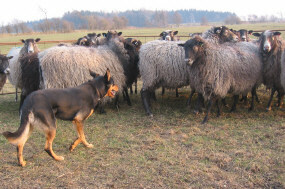 Most dogs got disqualified by biting or loosing sheep (just running on top of the dogs) or retired. Mate did a great job, was in good control on outrun, lift and fetch. While driving he got a bit stuck because of eye. I have to work on this. 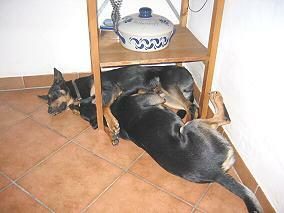 Next day at the clinic the judge said that a lot of the 35 dogs had problems with their balance. 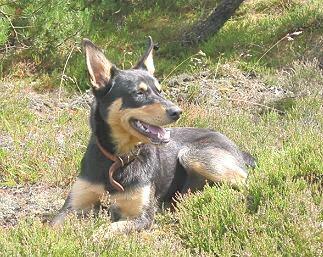 But the dog with an outstanding balance and an immense feeling for the sheep was the Kelpie. A lot of people told me that it was great to watch the dog running. 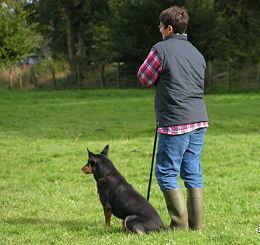 While training he said there is not anything to be corrected in the dog, he was always doing right while balancing and driving and that it is only the handler who has to improve. I was very proud of my little dog. 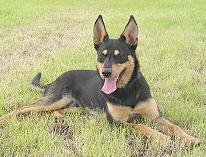 "I have started my Kelpie in ISDS trials on very low/novice level. He has won twice in the lowest class and placed third in the next one up. 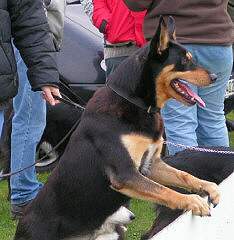 After the last trial the judge said that my Kelpie was the dog with the best balance of all dogs of this trial and that he has an immense feeling for his stock. I have been to several clinics with British handlers. In both, trials and clinics I have not felt any disadvantage in being judged or treated. Of course, one Scottish judge told me that he would take a point off, if the dog (also a BC) carries his tail up. But that is all. 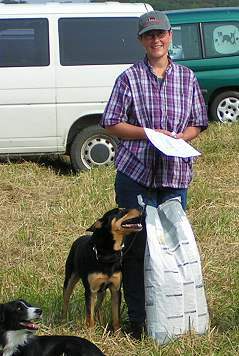 I do not have any problems in Germany in the BC scene as long as my dog performs well. "I have a lot of work for Mate to do, he is such a big help. When I get around I take Scott to the cows too. The cows have a lot of respect of him. The more work he gets the better it works. If he had some time off he is still quite fast and tight. I still take him to agility if there is spare time and everyone is impressed about his jumping ability and speed." "He has won twice in the lowest class and placed third in the next one up. 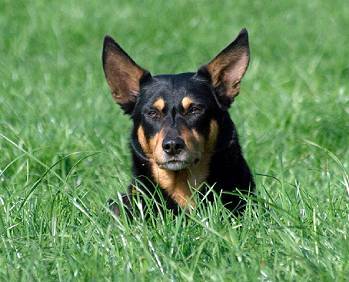 After the last trial the judge said that my Kelpie was the dog with the best balance of all dogs of this trial and that he has an immense feeling for his stock. " Okay, I got that, so we really have to start open now. But this means a lot of training over far distances (400m or more) and whistling of course. The picture was taken at the last trial in May where Mate won. This meant we have to start open now. I signed in for the end of August and I am a bit excited about it because we are still working on our whistle commands. Mate also needs a bit of finetuning after all that farm-cow-work... But it is just a start and we have a goal to work to! He also just loves to go to trials! It was a different type, not British. More like a utility type with 15 sheep - under German herding conditions. But to me very simple. 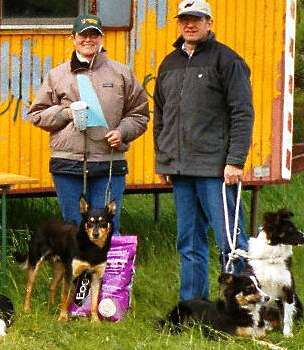 But still, there were other dogs, even open class, there and I only lost 7 points so we made it! "On the trials everyone comes up watching when he is running (they might be all looking for the disaster, hehehe) and it looks like people think it's great when he is doing well. He is also friendly to everyone. He is also very friendly to other dogs. 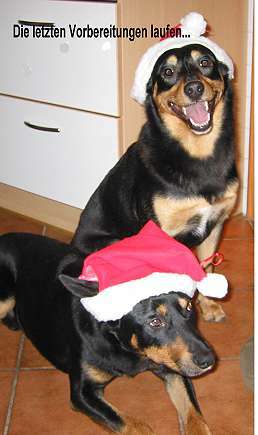 But what he really dislikes is to be stared at by some male BCs"
Hi you two, here some pics of the best dog in the world!